The East Public Health Center found a great way to team-build – build the team up! During its November all-staff meeting, in the spirit of the upcoming Thanksgiving holiday, the office decided to do a team-building activity based on gratitude. They talked about how Thanksgiving is a holiday to celebrate everything we are thankful for, but how unfortunate it is that it only comes once a year. "Feeling appreciated at work is the most important thing to most employees," said Janet Lunsford, a senior office assistant. "So our gratitude for our team members needs to be stated much more often than annually." 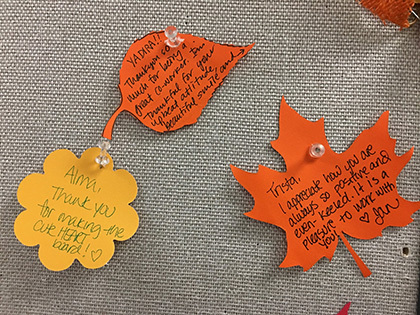 After the discussion of continuous gratitude, the team passed around a basket that contained everyone’s name on pieces of both red- and orange-colored paper that had been cut out into leaves. Everyone was instructed to pick one orange and one red folded paper out of the basket. They went around the table and each team member got to tell the person’s whose name was on the orange paper what they appreciate about them – face to face. "Everybody was so kind and sincere to each other and the experience was very moving," said Lunsford. After that, the team was asked to write a short thank-you note to the person whose name was on the red-colored paper they drew. The end result? A HEART wall for all to read and see. "We are hoping that our staff realizes that each one of them plays an important role on our team and they are all valued by each other," said Lunsford. "We named this exercise ‘A Grateful HEART.'" Why are you thankful for your colleagues? Tell us in the comments!